Welcome to a new feature here on Cookin’ Mimi. I am going to highlight one of my favorite previous recipes. It will probably be a monthly feature until I get a few more recipes posted. I’m kicking it off with one of my favorite cookies. 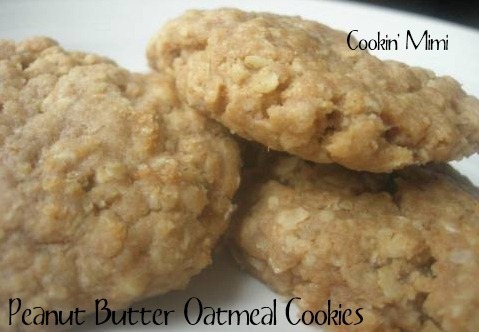 Peanut Butter Oatmeal Cookies were first published way back in August of 2009. They are one of my favorite cookies especially warm out of the oven. They are soft, filling and comforting. Whole wheat flour is one of the ingredients which makes them a bit more unusual than the other cookies I have posted.